No seriously, we’ve always enjoyed a good relationship with our friends over at TechCrunch and while we enjoy the healthy competition, we do still support each others projects whenever possible. 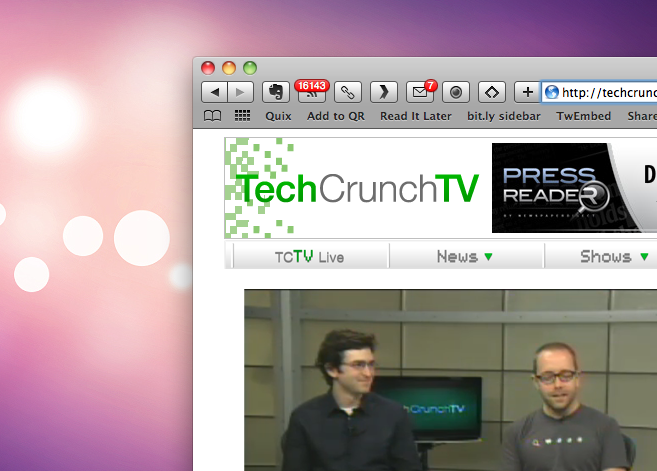 This time its TC’s latest venture, TechCrunch TV. TechCrunch founder Arrington and CEO Heather Harde appear to have gone all out on the project. Building a production studio into its new offices, employing ex-CNN and Yahooer Jon Olrin, as well as recent acquisition; presenter Evelyn Rusli from Forbes. Its writers of old are also getting in on the action with MG Siegler and Jason Kincaid hosting their own show together, while the likes of Andrew Keen, a favorite of ours, will host his own discussion show every Monday. If the idea of tech Internet television fills you with excitement be sure to get subscribed up to TechCrunch.TV, it’s still a little rough around the edges but it is only a few hours in. You’d also be wise to follow Leo Laporte’s twit.tv and the various shows on the Revision 3 too, all GOLD (any other recommendations?). We’ll be watching whenever possible and hope you do too. For those of you wondering whether we’re exploring the Internet TV territory … stay tuned, so to speak. Read next: Watching your Twitter follow ratio go down the tubes? JustUnfollow.